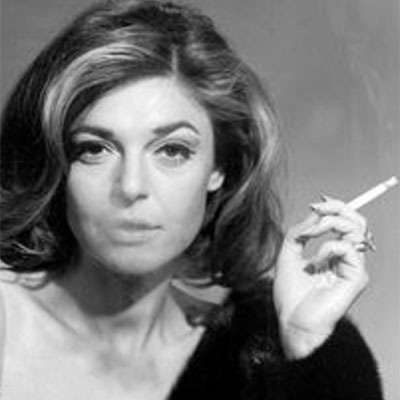 Anne Bancroft’s styling was as vivid as her performance as the bored Beverly Hills house wife and boozy seductress Mrs. Robinson in The Graduate. The film, that’s celebrating its 50th anniversary, featured Harry Winston diamonds. The jewels captured the zeitgeist of the 1960s as much as the Simon and Garfunkel soundtrack of the Mike Nichols directed dramedy. What? That’s right. Let me explain why Harry Winston was the right choice for the movie. Every big name in jewelry has an era when their designs became the designs. Harry Winston was a mid-century man. Gigantic diamonds, were popular in the booming economic period and Mr. Winston literally had the best and the brightest. He became a pop culture phenomena when Marilyn Monroe cooed “Talk to me Harry Winston, tell me all about it!” during her show stopping rendition of “Diamonds are a Girl’s Best Friend” in the 1953 film Gentlemen Prefer Blondes. In 1958, the jeweler transformed into a bonafide celebrity when he donated the Hope Diamond to the Smithsonian Institution. Almost as soon as he bequeathed the famous 44.5-carat inky blue gem, it became the museum’s most popular attraction. Lensman Irving Penn created his iconic jewelry photo, Faucet Dripping with Diamonds, at Harry Winston’s sink with three giant pear-shapes in 1963. In 1968, the cleaving of Harry Winston’s 601-carat Lesotho rough diamond was broadcast on live television. The stone was eventually cut into 18 gems. One of the largest, named Lesotho III, was fashioned into a 40.42-carat marquise shaped diamond and purchased by Aristotle Onassis. He presented it to Jackie Kennedy as an engagement ring. The year before Jackie got her marquise, Anne Bancroft flaunted a large Harry Winston engagement ring set with the boat shaped stone in her iconic role as Mrs. Robinson in The Graduate. The first time she tries to seduce Dustin Hoffman, she also wears cluster earrings and a twist bracelet from Winston. While the other jewels are, well, peeled off during the course of the film, the ring stays on. It’s as signature to Bancroft’s look as her leopard coat and lingerie as well as her amazingly highlighted coiffure. Now you can see the diamonds shine on the big screen once again. In celebration of the film’s 50th Anniversary, an ultra-high definition restoration of the 1967 movie is being released in theaters on April 23rd and 26th. Find out about show times and tickets here.